I have been a member of CrossFit Athletics since November 2010. Since that time CrossFit Athletics has impacted both me and my family in ways in which I never imagined. Having been an athlete in numerous sports, since a very young age, I was continually trying "the next best thing" in order to progress my athletic achievements. I can say with utmost confidence that CFA, is without a doubt, the best thing that I have been involved with in 25+ years of sports. I am a stronger, faster, quicker, and more explosive athlete then I was 15 years ago. Moreover, as the father of two young children, I strive to expose them to health and fitness at a young age. CFA has provided my two young children with people to look up and aspire to be but has also provided them exposure to a gym-environment that my children feel comfortable being in. Whenever I am working out, away from CFA, my children always have to participate in addition to taking on the role of our excellent coaches. It is nearly impossible to drive two blocks away from CFA without my children wanting to drive by and stop in, or simply see if the garage door is open. CrossFit Athletics continues to challenge me and push me to my limits every day. It has shown me my true potential and has made me a more confident person overall. From the changes in body composition and strength to the sense of community at CrossFit Athletics, I could not ask for a better experience. The coaches believe in me when I don't believe in myself and for that, I cannot thank them enough! When I started CrossFit lets just say I didn't have the greatest idea of it inside my head. But I hit a plateau in my progress and decided I needed a change. 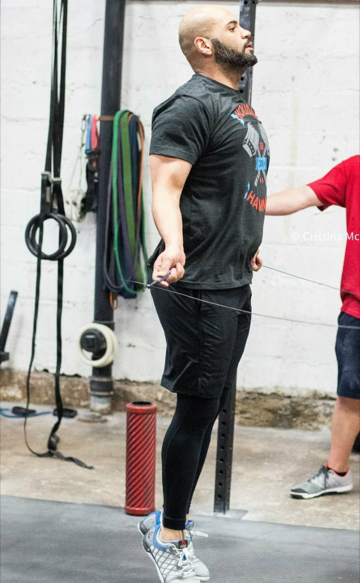 I gave CFA a shot and after a short time I realized how wrong I was and how wrong the stereotype of a CrossFit athlete was. Everything was explained by the coaches as to why and how things were done. I learned a lot more about how the body functions and how to make it all around stronger. I could not ask for more from the Endurance program. I PR'd my marathon time by almost 20 minutes to 3:35:35 and I feel I can cut even more time off. My legs and running have never felt stronger. Towards the end of the race I felt strong and was able to crank out negative splits. This didn't feel that way in my past races. Also, I typically ate pretty clean but Jenn really helped dial in my diet to ensure I was getting the right mix and amount of calories. This certainly made a difference. All around I just felt better when running. Most notably CFA is like a community and that really showed after my race the next time I came to the gym. Even people I didn't really know we're congratulating me. It's cool to see everyone pulling for one another. This happens everyday during the workout too. A lot of times people wait and cheer until the last person completes the WOD. In that atmosphere it's hard not to get pumped up. I just went through my old workout log searching for my 5k row time. No luck. On my search I skimmed through some old workouts and saw the progress I have made. Some big, some small. ALL GAINS! It actually choked me up a bit. I know my progress starts and ends with me. But in the middle, somewhere, the two of you (Gabe and Jenn) have been nothing but AMAZING catalysts! I hope it doesn't get old, because I will never stop thanking you both for seeing in me from day one, something I have only recently seen in myself. Thank you.